People blame things on bad management because, well, it’s fun. But they’re also looking for a scapegoat. If you want to create great work, you must also realize that most management is imperfect and that you must succeed despite this. 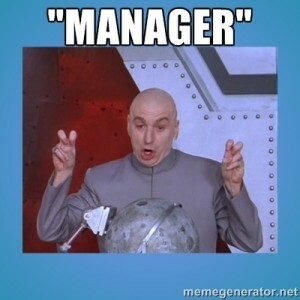 In one of my roles years ago, my staff was bitterly complaining about executive management behavior. The behavior didn’t match our core values, it was preventing our success, it was aggravating, on and on. Was it true, or not? It doesn’t matter. Just like your Mom taught you long ago, just because other people are jumping off the Empire State building doesn’t mean you have to buy in to that nonsense. Are you at work to admire those above you in the food chain? Or are you there to figure out how to achieve your goals and create value no matter what the obstacles? I have observed that most employees think that “upper management” is all-powerful, that the actions that they take will make or break the organization, and that everyone else in the building is a prisoner in the starship as the evil people in the control room drive the starship into the heart of a star, destroying it utterly. It’s just not true. Leadership isn’t where you sit. It’s what you do. Individual actions count for a lot. I have seen individuals or workgroups profoundly change organizations. When Bill Schlough, CIO of the SF Giants, started his job, he began doing employee reviews in a more methodical way than the larger organization required or desired, with great results. In a couple of years, the entire organization adopted his methods – because his methods were provably better. I’ve personally seen this phenomenon happen with project management practices, customer service — on and on. Never say you can’t change the world from your cubicle, because you can. Just take the first step to make things better and people will follow your leadership, whether that leadership is formal or informal. Span of control, or the ability to micromanage individuals, is also highly overstated. Truly large organizations, by virtue of being truly large, can’t pay attention to each employee at all times. They can have an influence on an employee’s success or failure, but can’t force employees to succeed or fail. There’s plenty of room to be successful at a dysfunctional organization, just as there’s plenty of room to fail at a successful organization. The bottom line is this, then. You can spend your time and energy focusing on your “bad management”, or you can spend your time and energy focusing on everyone else. So how did I address my employee concerns about top management, back in the day? I would coach them to focus on the many, not the few. That is, let’s assume that you have a terrible CEO, CFO, and CIO. (Especially if the CIO is ME! LOL.) Those are only three people out of perhaps thousands of others at the organization. Quit spending so much time and attention on them, and start focusing on the thousands. How can you help your co-workers? How can you delight customers? That’s the real work that you want to do. And that’s not only the road to success, it’s the road to finding meaning at work.